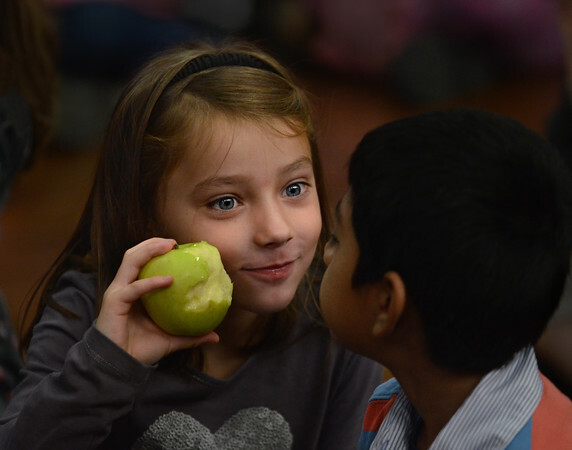 First-grader Malia Bolcome shows her apple to classmate Edilson Gomez after taking a bite out of it Monday during a "Big Apple Crunch" event at Veterans Memorial Elementary School in Gloucester. The event, timed to roughly coincide with Food Day, was organized by Backyard Growers of Gloucester. Locally grown apples from the West Gloucester Orchard were handed out to each student during a school-wide assembly, The children were asked to bite into their apples at the same time to see if they could make the "loudest crunch in Massachusetts." Leftover apples were expected to be available at lunchtime for several days afterward.